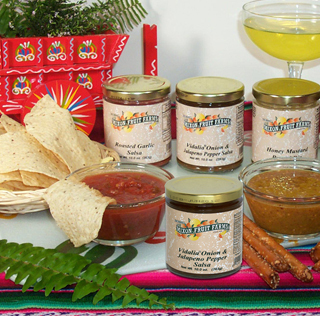 Made especially for Mixon, these unique salsa flavors will wake up your taste buds! Great for dipping, on tacos, or in that special nacho dip you love to make! The Peach or Pineapple Salsa will enhance the flavor of your favorite fish fillet. Superb! Corn Salsa - This Salsa adds that wonderful taste of Tex-Mex. It's right down San Anton' way! Peach Salsa - Made with fresh peaches and vidalia onions. One of the best sellers with a sweet and slightly hot taste. Complements all your favorite fish dishes. Super as a garnish for your steak! Pineapple Salsa - A tropical salsa with a sweet and slightly hot taste. Great as a chutney topping on your favorite steak or delicious with fish. Roasted Garlic Salsa - Made with fresh peaches and vidalia onions. One of the best sellers with a sweet and slightly hot taste. Complements all your favorite fish dishes. Super as a garnish for your steak! Vidalia Onion & Jalapeno Pepper Salsa - The spiciest and hottest of our salsa. Green jalapenos complement all the other ingredients.